Extracorporeal shockwave therapy, or ESWT, is a therapeutic procedure in which short, fast sound waves are directed at various tissues of the body to produce a number of clinical effects. While the use of ESWT is just picking up in Canada and the US, it is being widely used in Europe for the treatment of a number of conditions related to bones, nerves, muscles and connective tissues. 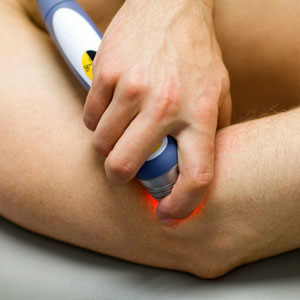 There are two main types of shockwave therapy being used: radial shockwave and focused shockwave. Radial shockwave therapy is what our clinic uses and is what the rest of the following information will focus on. Shockwaves produce pressure and tension forces at the site of tissue injury, which lead to increases in cell membrane permeability and increased microcirculation. It allows for greater cellular nutrient exchange related to healing as well as dissolution of calcific deposits. After the wave of pressure, a negative pressure space is created behind it which produces what is called a cavitation bubble. These bubbles are simply empty cavities that expand and collapse. As cavitation bubbles burst, they create another force of a microjet which can also help break down unhealthy cells and calcium deposits in the tissues. Thousands of these cavitation bubbles are produced during a shockwave treatment. Shockwave therapy has been explored for its cellular regenerative effects. It can help diminish pain levels in the tissues through both hyper-stimulation anesthesia and pain gating. Hyper-stimulation anesthesia involves bombarding the nerves sending pain signals to the brain with stimulation so much that they get fatigued and their activity decreases. Pain gating involves stimulating nerves that can close the “gate” to the brain, preventing the transmission of pain signals and allowing a change in pain perception. One of the aims of treatment is also to create a controlled and directed inflammatory response within the body, allowing specific immune system cells to come to the area of damage to clean up any cellular or calcific debris and promoting future healing. Strong energy pulses faster than the speed of sound are produced by an air compressor-driven “bullet” striking a treatment head of the apparatus. With the different heads and settings, we create precisely controlled shockwaves that reach different depths in the body of varying pressure. As a result, we are able to easily control the shockwaves for the structure that we want to treat as well as for patient comfort. Shockwaves pass through water with little to no effect. Tissues that have adequate hydration levels (blood vessels, organs or healthy cells) are typically bypassed by the shockwaves, allowing us to specifically treat desiccated tissues (scar tissue, fibrosis deposits, calcific deposits or unhealthy cells). For most conditions, pain relief can be achieved in as little as 1-2 treatments with 3-4 treatments sufficient for full complaint resolution. That said, each patient is different and may require more treatments to resolve their complaint particularly if the issue is chronic or very severe in nature. Generally, three treatments are recommended followed by a re-evaluation after 6 weeks. At this time if further treatments are required, it will be discussed with the patient. Treatments can be performed between 72 hours and 15 days apart. At a shockwave treatment, patients will be gowned or directed to bring appropriate clothing so that the area to be treated can be exposed. Ultrasound gel is applied to the area to be treated, unless the treating practitioner is using a non-metallic treatment head which does not always require the use of gel. The practitioner will select the appropriate treatment head and settings to produce the desired effect. During treatment, the patient may feel some pain or discomfort. The treating practitioner, however, will work within each individual’s pain tolerance (6-7/10 VAS scale rating). As the practitioner makes subsequent passes over an area, local pain levels should diminish. After treatment, patients usually experience immediate relief. Some may feel pain or discomfort that can last for a few days to two weeks. Mild side effects include tingling, redness, aching or bruising but are rare. In a small subset of patients, there may be no immediate response with the patient experiencing what seems to be spontaneous symptom relief or resolution of their complaint up to six months post-treatment. The diagnosis and body’s healing speed determine how long the healing process takes in total. It is generally recommended that after treatment, patients refrain from applying ice, heat or any topicals (unless prescribed) to the area for 12-24 hours. They should also be sure to drink plenty of water in the days following treatment. Shockwave can generally be used in combination with other therapies (chiropractic, massage, physiotherapy or acupuncture) but some patients find that shockwave is sufficient as a stand-alone therapy. Appointments are $150.00 per treatment and are not payable through direct billing; however, receipts for treatment can be provided. Most insurance companies will cover shockwave under chiropractic allotments while some may cover it under physiotherapy, massage benefits or even health spending accounts. Patients should check with their individual third-party insurance provider to determine what benefits are available to them. Contact us today to schedule your time for shockwave therapy! Shockwave Therapy – BC website. Accessed September 25, 2015. Barisha, Uran. Presentation notes to providers at 360 Wellness Bearspaw. Presented on August 22, 2015. Wes. OJ. A Neural model for chronic pain and pain relief by extracorporeal shock wave treatment. Urol Res. 2008 Dec;36(6):327-34. doi: 10.1007/s00240-008-0156-2. Epub 2008 Oct 7. Storheim K, et al. Extracorporeal shock wave therapy (ESWT) and radial extracorporeal shock wave therapy (rESWT) in chronic musculoskeletal pain. Tidsskr Nor Laegeforen. 2010 Dec 2;130(23):2360-4. doi: 10.4045/tidsskr.09.0654. Shockwave Canada Website. Accessed Sept 27, 2015.